You chose an excellent time for your Study Abroad semester in Prague. Spring and summer are coming, so you will get the chance to spend much more time outdoors. You have probably already explored everything around the UNYP campus and are looking forward to exploring the city outside Vinohrady. The weather in Prague has been getting hotter in recent years, but no worries – there are plenty of ways to stay cool in the city. Museums and galleries have to maintain strict temperatures to preserve the paintings on display, so there's never been a better time to take in some of Prague's foreign culture. However, we also recommend getting out and visiting the city’s parks and open pools, open air-cinemas and film festivals. Great weather and beautiful sights – what else do you need for a perfect day off? If this is your first year studying at UNYP, get ready for an unforgettable spring semester experience! Spring and summer are the best seasons for long walks in Prague, and Prague 7 is a part of the city that most short-term travelers miss. If you want to wander without the crowds on a lazy Saturday, we suggest the vast, grassy Letna Park, with its fantastic views over the city. 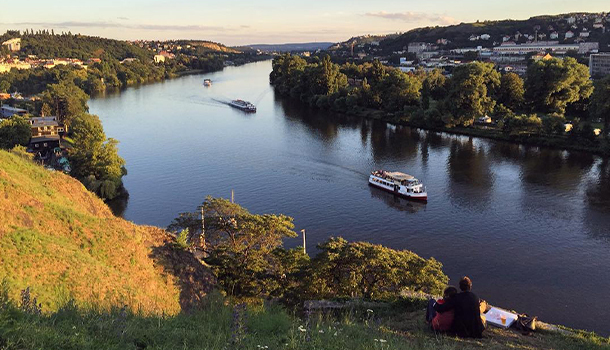 You should take a walk around the old historical fort Vyšehrad at least once during your semester in Prague. Wander through the Vyšehrad Cemetery, the resting place of famous Czechs such as Alphonse Mucha and Bedřich Smetana; take a look at the Basilica of St Peter and St Paul, and the Rotunda of St. Martin, one of the oldest Romanesque churches in Prague. Enjoy the peaceful view of the sunset over the river, and don’t forget to bring your camera! You might have visited Prague Castle already, but have you found all its secluded gardens? You could spend a beautiful warm day exploring the castle's premises; there is a lot to see. The original Renaissance Royal Garden, built in 1534, is one of the few quiet places in the center of Prague. Don’t miss Na Baště Garden, situated on the western edge of Prague Castle with its contemporary 20th-century design, which combines Italian and Japanese garden styles. Luckily, Prague has a few outdoor pools, including Podolí, one of the most popular pools because of its location and lovely lounge area; Divoká Šárka, located in a gorgeous wooded park on the edge of town with a wild landscape; and of course Aqua Palace - Prague’s biggest and best waterpark with something for everyone. Finally, to wrap up your outdoorsy weekend, you could enjoy an evening by the river in one of Naplavka’s many open-air bars. Every spring this newly-renovated riverside area transforms into a hip and trendy hangout area with moored boats hosting techno parties.